The following are the latest results contributed by HM Courts Service, for cases sentenced by West Sussex Magistrates’ Court sitting at Worthing from November 2 to 9, 2017. Zayyan Oderuth, 24, of Teville Road, Worthing, was given a community order and must carry out 80 hours’ unpaid work after admitting using threatening, abusive or insulting words or behaviour with intent to provoke the immediate use of violence or suggest violence would be used in Worthing on July 31, 2017. He was given three restraining orders and must pay £50 compensation, £85 victim surcharge, £155 costs. Jimmy Ripley, 36, of Withy Patch Caravans, Old Shoreham Road, Lancing, was fined £250 and must pay £30 victim surcharge after admitting using a vehicle without insurance in Brighton Road, Lancing, on December 21, 2016. His driving record was endorsed with six points. Radoslaw Koskiewicz, 43, of Tarring Road, Worthing, was fined £180 and must pay £30 victim surcharge, £250 costs, after being found guilty of failing to identify a driver when required by police in Shoreham on May 8, 2015. His driving record was endorsed with six points. James Bates, 55, of Churton Court, Navarino Road, Worthing, was fined £103 and must pay £30 victim surcharge, £100 costs, after admitting being the registered owner of a vehicle that did not meet insurance requirements in Godalming on October 21, 2016. Jack Reader, 26, of Rowlands Road, Worthing, must pay £60 costs after admitting breaching a community order by failing to attend RAR sessions on September 29, 2017, and October 13, 2017. Deborah Scully, 52, of Anscombe Road, Goring, was given a 24-week prison sentence, suspended for 18 months, and must carry out 120 hours’ unpaid work after being found guilty of dishonestly furnishing Worthing Borough Council with a false tenancy agreement with a view to obtaining a benefit in Worthing on January 24, 2015. She was given a 24-week concurrent prison sentence, suspended for 18 months, after being found guilty of dishonestly making a false representation to Worthing Borough Council using a Housing Benefit claim form with a view to obtaining a benefit in Worthing on January 24, 2015. She must pay £115, £620 costs. Grant Fraser, 28, of Canada Road, Arundel, was given a four-week prison sentence, suspended for 12 months, with Drug Rehabilitation Requirement and Rehabilitation Activity Requirment after admitting stealing meat worth £18 from Iceland, Rustington, on July 29, 2017. He was given a 12-week consecutive prison sentence, suspended for 12 months, and must pay £100 compensation after admitting assault by beating in Rustington on July 29, 2017. Angela Langley, 38, of Dorset Road, Bognor Regis, was given a community order with Rehabilitation Activity Requirement and must pay a total of £200 compensation, £85 victim surcharge, £85 costs, after admitting two charges of assaulting a police constable in South Street, Lancing, on August 24, 2017; and assaulting a third police constable by beating in South Street, Lancing, on August 24, 2017. She also admitted using threatening or abusive words or behaviour or disorderly behaviour likely to be caused harassment, alarm or distress in South Street, Lancing, on August 24, 2017, no separate penalty. William McNaughton, 61, of Brougham Court Central, Brougham Road, East Worthing, was discharged conditionally for 12 months and must pay £20 victim surcharge, £85 costs, after admitting stealing four bracelets worth £47 from Beales, Worthing, on August 1, 2017. 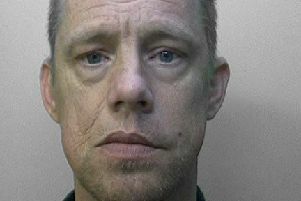 Kenneth Mitchell, 38, of Dukes Close, Arundel, was given a community order, must carry out 200 hours’ unpaid work and was disqualified from driving for 12 months after admitting taking a vehicle without consent and causing damage to another vehicle before it was recovered in Barnham on July 1, 2017. He was given a community order and disqualified from driving for 39 months after admitting drink-driving (132mg of alcohol in 100ml of blood) on the B2233 Barnham on July 1, 2017. He must pay £85 victim surcharge, £85 costs, and was disqualified from driving for six months after admitting driving without insurance. He also admitted driving without a licence, no separate penalty. Jasmine Wickens, 20, of Steyning Close, Goring, was fined £189 and must pay £30 victim surcharge, £85 costs, after admitting dishonestly failing to promptly notify the Department of Work and Pensions of a change in circumstances, namely increased earnings, affecting carers allowance in Worthing between November 4, 2013, and April 17, 2016. Charlie Glynn, 18, of Brook Barn Way, Goring, was fined £320 and must pay £32 victim surcharge, £85 costs, after admitting drug-driving (75mg of MDMA per litre of blood) in Sea Place, Goring, on September 5, 2017. He was disqualified from driving for 12 months. Daniel Jones, 36, of Upton Brooks, Barnham, was fined £300 and was disqualified from driving for six months after admitting driving while disqualified in East Street, Littlehampton, on October 21, 2017. He was fined £150 and must pay £30 victim surcharge, £85 costs, after admitting wilfully obstructing a police constable in East Street, Littlehampton, on October 21, 2017. Jamie Sparrow, 26, of The Haven, Brighton Road, Lancing, was fined £166 and must pay 330 victim surcharge, £85 costs, after admitting drink-driving (128mg of alcohol in 100ml of blood) in Beach Green, Shoreham Beach, on July 21, 2017. He was disqualified from driving for 14 months. He also admitted breaching a conditional discharge order, no action taken.